I have meditated on the Christmas and Easter story every Christmas, for—goodness–decades, and every year find new diamond-glints in it. It’s one of those magical stories which speak to everyone. To the poor and down-and-out, as most of humanity have been for most of time, and to the up-and-out. Joseph and Mary, forced to migrate at the behest of a colonizing power to Bethlehem, where they were homeless, while she laboured with her illegitimate child, the child of scandal. She places the baby in a manger, a feeding trough for animals. If Jesus was–as I believe he, of course, was– God himself, he could have chosen a blaze of earthly glory to make his presence felt. He could have chosen a throne. But he chose to come to a colonized and oppressed people, to be born of a woman pregnant before her wedding day; he chose a unhygienic manger for his crib, thereby exalting the simplest and humblest of choices. But God connected him. He could not be hidden. An angel, no less, announces his birth to shepherds, announces that Jesus is the way to joy, that there is peace to men of good will. Wise men, Magi, saw a new star, heralding the birth of the King of the Jews, and followed it to the child, giving him precious gifts, gold, frankincense, or perfume used in censers in the temple, and myrrh, used in anointing oil for kings and prophets. Scandal, homelessness, rejection, muck, odours. Angelic voices hailing him; shepherds worshipping him; distant Kings lavishing precious gifts on him. To a lesser extent, that will be the path of all Christ’s followers… unmerited scandal, rejection, undeserved suffering, perhaps patches of poverty. And also affirmation from those who might see Christ in their lives, and on their faces, and unasked for precious gifts, gold, frankincense, myrrh. The glory and goldenness; the muck and shame. Sweet love and bitter hatred. Christ did not escape them–he held his head high whatever shame was heaped on him—and neither shall we. Christ’s example compels some to choose the path of voluntary downward mobility… Saint Francis and Mother Teresa, Jackie Pullinger, Heidi Baker, all those who work in inner cities. That is not a call I hear. A call I do hear is the call to simplicity. Simplicity in clothing, in make-up (or the lack of it! ), simplicity in furniture, in choices of food, or holidays. Simplicity whenever possible; find the simplest option, God is more likely to be found there in the time and soul-space it frees up. Simplicity for the sake of our own souls; simplicity because our time on earth is limited and should be well-spent; simplicity because complexity is a waste of self and time and spirit; simplicity because there are poor on this earth; simplicity because of Christ. While voluntary downward mobility is a call to a few Christians, voluntary simplicity, I believe, is a call to all Christians, to all sane people. But to the manger unasked for came gold, frankincense and myrrh, precious gifts Mary accepted on behalf of her precious son, gifts which sustained them when refugees in Egypt. So if and when through hard work or God’s favour, these colourful gifts appear, accept them with a grateful heart, enjoy the good things of this transient world, never losing sight of the gift of simplicity, or the gift of Jesus, and his counter-intuitive teachings which are the way to the great joy the angel promised. That is what I am reflecting on this Christmas. And if you’re interested in a family catch-up. It’s been an important year in the story of our family. Zoe graduated from Oxford University with a BA in Theology, and is working as a Stepney intern at St. John’s Church, Hoxton, which she loves, getting stuck into preaching, community organising, youth groups, etc. She is continuing to study Theology part-time at St. Mellitus College, London, taking courses in Political Theology. We heard her preach at St. John’s last Sunday, and she was excellent. She is living with other interns in a beautiful spacious Church of England house in central London, almost a mansion! Irene matriculates at the University of Oxford. Irene graduated from Oxford High School, was chosen as “Young Biologist of the Year,” by Science Oxford, and won the school prize for Chemistry. She’s doing Medicine at Christ Church, Oxford University, and was delighted to be chosen as a Christ Church Prize Scholar with a cash prize of £9200 a year (which is good, since Medicine at Oxford is a six year course). She loves the whirlwind of Medicine, and has had courses in biochemistry, physiology, pharmacology, molecular genetics, anatomy and medical sociology!! Irene has a paid job too, blogging about her medical studies for Medic Portal! And as for me: I am in the middle of my third year of German classes at Oxford University Continuing Education. It was a complete whim; I wanted to do something completely different in 2015, and chose a language I had never seriously considered learning. Learning German was hard at first because I was reluctant to buckle down and memorise the grammar, but I now experience flashes of pure joy when I understand the flow of fast German, when I converse in German, when I read a German poem, and understand it. I am so glad I persisted! Summer holiday with the family… The Bavarian Alps and the Black forest. Totally restful. We visited Budapest for the first time in October to stay with Peggy Goetz, my American friend, a Calvin College professor, who was teaching there for a semester. A fabulous history-drenched city I will definitely revisit (and a great walking city). We had a mini-walking holiday in the Brecon Beacons in Wales, and straight after Irene’s term, went to Cyprus for 9 days, a hedonistic visit of beach walks, and ancient ruins! Roy and I are slowly easing into the rhythm of being empty nesters, are focusing on health and fitness, organisation, and slipping into a rhythm of serious work. 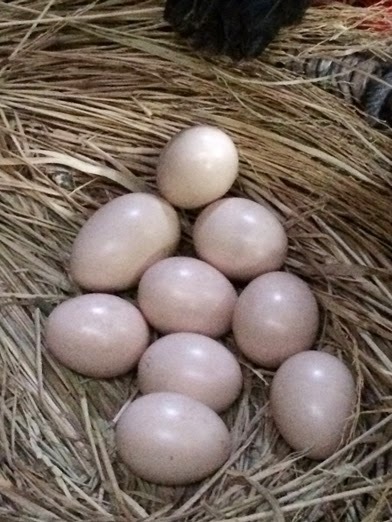 Empty nesting? Ssshhh… we like it! And he replied, “Go out into the darkness, and put your hand into the hand of God. So I’m just back from a thoroughly refreshing summer holiday, hiking in the Bavarian Alps. On the boat trip to Konigsee, a very formal bugler played his horn, and the craggy mountains echoed the tune. It was a magical moment. We hiked all day in unspoilt, psychedelic landscapes, like a movie set, like heaven, I imagine, will be. We hiked, we hiked for 13 days, Tergensee, Chiemsee, Konigsee, Neuschwantein Castle, the Black Forest…. I was hiking to deep and pleasant tiredness, but not exhaustion, averaging 12, 200 steps a day on my pedometer, several miles. And my heart was full of majestic mountains, of flower-strewn Alpine meadows, crystalline mirroring lakes, and streams, rippling. But then, though we had decided to spend 16 days hiking, I wanted to turn around. I had seen enough beauty for now, I was tired, I was ready to resume my regular life, meditating on the Bible, praying, reading, writing, gardening, running, yoga, family life, life with dogs. Zoe said, “Spurgeon was right. Perhaps Jesus is better than the Alps.” And he is. Of Him, I never weary. I never weary of seeking his wisdom, of trying to see my life and my world through his eyes, of trying to align my life with the axis of his brilliant quirky vision. I never weary of reading his words, his encounters with people. How startling and unusual he is, how refreshing. How wise. How unique. People know Jesus in different ways, and with different intensity. When I see someone who really knows Jesus, preserved in the written word, but alive and invisibly stalking the earth today, I realise how comparatively slight and shallow my knowledge of him is. And I resolve to deepen it. For when my life gets aligned with his wisdom, with how he would tell me to live my life were He visibly here, my life feels joyous, exciting, and refreshing, like those mountain streams. Anyway, a brief personal catch-up. We are in a liminal and lovely season as a family. Zoe has graduated from Oxford University with a good degree in Theology, and Oxford’s Headley Lucas Prize in Theology, and will be working at St John’s Church, Hoxton, London come September. And Irene has graduated from Oxford High School. She won the “Young Biologist of the Year,” award sponsored by Science Oxford and Nuffield Department of Medicine; her school’s prize for excellence in Chemistry, and awards for achievement in Maths, Biology, and academic excellence. Lots of book tokens! Tell me, what is it you plan to do with your one wild and precious life? Mary Oliver. Roy and I will soon be empty nesters, and have just begun to think about how to live this third age/stage of life well. I hope to read deep and write hard; to get physically strong through long hikes and yoga; to garden, to travel, to continue to learn languages (we’ve been learning German for the last two years), and to have friends over to leisurely meals. We’d love to grow spiritually deep, intellectually deep, and to continue loving God, and people. No doubt, we will keep refining our preliminary thoughts. Wishing you a happy summer, dear readers. Enjoy this beautiful season of your one wild and precious life. The Doni Tondo, a rare canvas painting by Michealangelo. Scroll down for more images. I spent the first Sunday of January 2106 at the Uffizi Gallery in Florence. It was free, and advice online, as well as unsolicited advice on Facebook warned me that the lines were horrendous. But visiting Florence and not spending a few hours at the Uffizi seemed like something I would always think of with sadness. Though I have visited the Uffizi before in the 1986 and 1997, I am a different person now, know more about art, and appreciate it more deeply. In fact, when everyone cautions me against something, I often wonder if God is saying the opposite. If what “everyone says,” and the beautiful mind which created the Universe were in sync, what a beautiful world it would be! When I heard the co-author of Grace and Forgiveness introduce her book on the power of forgiveness as worth a trillion dollars, I laughed but, yes, absolutely. She’s right!! In Grace and Forgiveness the Arnotts quote Mark Virkler: The Holy Spirit is always positive, and Satan is always negative. There is some truth to this. Negative advice from negative people cuts off hope and possibility thinking. Crushed, the couple bought a ticket on the next steamer, and returned to India. But, as it happened, that foolish nay-sayer was wrong. In Wales, in 1904, people were experiencing God’s “love, vast as the ocean, loving kindness like a flood”. They were surrendering their lives to God, repenting of their sins, forgiving everyone who had sinned against them. They were experiencing spiritual joy, the spiritual life. All of which the couple missed because they listened to the negative words of a negative person!! A long way to say: I am glad I went. The lines looked horrendous, but my family told me to sit down, and so I did, and brushed up on art history, totally absorbed, and all of a sudden, we were in, and I got to see as much as I had the energy for. I am so grateful to the Medici for collecting these treasures, and to the last of the Medici for gifting them to Florence. And here are a few of my favourites. Sandro Botticelli, Madonna of the Pomegranate–beautiful angels, very fashionable virgin with a cool scarf! Raphael (below). The Pre-Raphaelites, Oxford undergraduates when they banded together, somewhat unfairly decided that true art ended with Raphael! Raphael’s portrait of Pope Julius II, the tormentor who chivvied, frustrated, angered and drove Michealangelo into genius–the inhuman effort of painting the ceiling of the Sistine Chapel, and, of course, crafting Julius’s own tomb. Fra Lippo Lippi–This painting is one of my favourites! I am looking at a year’s worth of photographs in this liminal week between Christmas and New Year. All photographs in this post were taken on my iPhone 6+ incidentally. Not always high quality, but you will get the flavour! Merry came on holiday with us, and loved it! Green for envy. Loved this market garden! Merry loved these cabbages–edible beauty. The world needs more of this if we are to cope with climate change. A French artist copies the Basilica in front of him. I have long wanted to explore the Basilica of St-Denis, the birthplace of Gothic architecture, in particular, of stained glass, under the leadership of the 12th century Abbot Suger . He decided to fill his Abbey Church of St. Denis, near Paris, with “the most radiant windows” so that worshippers, surrounded by rainbowed light would feel closer to God. Medieval craftsman, transformed sand into jewels, bringing in More Light, the credo of Gothic architecture. The Basilique Royale de Saint-Denis was the burial place of the Kings and Queens of France for a millennium, and we explored “the necropolis” with swarms of French school children, who discovered the Kings and Queens they had studied in history with yelps of delight. Incidentally, there was a terrorist attack and a raid at Saint-Denis a week after we left, and France closed all exits, so we were grateful for safety, and that we got to enjoy the Cathedral in a peaceful, relaxed way! Recreations of French fashion through the ages. Paris has more dogs per capita than any other European city, and most of its fabulous gardens are dog friendly. So we went with Merry to the Jardin du Luxembourg, which was ablaze in autumn colours, backlit with brilliance. I was amused by how Parisian parks close. No stated closing time. A gendarme appears at dusk, whistling. Everyone gets up. And he continues whistling until all we, like sheep, have peaceably left. The labyrinth for walking meditations outside Chartres. The Isle of Man is a perfect cross between the glories of Ireland and England. We loved it. We crossed on the Ben my Chree, which has a dog lounge. Merry loved it. We camped out by Glen Willyn on a deserted spot of the Atlantic, Loved sleeping breakers crashing on the shore. Merry adored the beach. Long walk up Glen Helen. The islanders were so friendly and helpful. When we asked directions, a cheery helpful elderly gentleman invited us into his house to show us on his map…and then chased after us for we left our guidebook there. Roy said he was like Tolkein’s Tom Bombadil, totally at ease in his landscape. Wandered around St. Patrick’s Isle, centre of Manx Christianity in the 6th century, surviving the pagan Viking Invaders at the end of the eight century. Enjoyed the miniature alpine gardens on the rocks. The fairytale chateau of Chenonceau on the Loire, which, unusually, belonged to a series of women, including Diane de Poitiers, mistress of Henry II, and his vengeful widow, Catherine de Medici, who evicted her. It is imaginatively built spanning the River Cher A fairy-tale chateau, isn’t it? I love it so much! Apparently, the female owners would walk up and down this gallery with fantastic views of the river and gardens for exercise and contemplation. A house designed by Lutyens. Gardens designed by Gertrude Jekyll. An Arts and Crafts house. We spent a happy day in the gardens. Étretat, scenes which inspired Monet. The Alabaster Coast. Panorama of Eretrat beach from the board walk. “Tudor” style building in Eretrat. Parc du Marquenterre, We spent a golden day in this bird sanctuary on the Somme. I love Scandinavian summers, the evenings of late, late light, wading in or sitting around the lakes, with their characteristic red cottages on shore. Tuomiokirkko, Helsinki, the Lutheran church, a mass of domes Seurasaari island. The beauty of an island, of course, is the plenitude of beaches. The sunlight shining on the water late in the evening was little short of magical We canoed down the gulf of Finland, loved the art nouveau cottages and log cabins, letting in the light. Would love to rent one of them sometime. I love the way that time is suspended and goes dormant when you are in a canoe on the water. Zoe and Irene are in this canoe. They capsized into the Baltic Sea later that day, but swam to shore. The Finns speak English with near-native fluency. The accents often sound American, until by the second or third sentence you hear tell-tale Scandinavian vowels. They shop in perfect silence. We stand out not only by our colour, of skin and clothes, but by the fact that we, horrors, talk to each other in the grocery store. I love Scandinavia in summer, and have visited Norway in 2009, Sweden in 2011, and Denmark in 2012. The Finns are warmest of the Scandinavians–but it definitely has a Scandinavian feel–a clean, decent, well-ordered, well-mannered, considerate society. When the Scandinavians die and go to heaven, or the Swiss for the matter, they will be surprised to see an improvement on their societies! Visited Uppenski Cathedral, the Russian Orthodox Cathedral of Finland, which was ruled by the Russians for too long. Iconostasis in the Russian Cathedral, Uppenski, which as our daughter Irene who is doing Religious Studies for her GCSE told us is a whole wall of icons. There was an exhibition of the paintings of Tove Jannson, author of the Moomins at the Ateneum. The daughter of a Finn and a Swedish woman (the prototype of MoominMamma), Jansson was a free spirit. She trained as an artist in Stockholm and Paris, and continued drawing and painting and writing for seven decades. It was fascinating to watch her art change, from the political (anti-fascist) in the Forties, through the abstract in the fifties, to the more fantastical and beautiful. And, of course, she illustrated the Moomins herself…which helps us know what a Moomin looks like. Like a hippopotamus, apparently! A long, interesting life of ever-evolving hard work. Tove Jannson was gay and it is not clear if being free of the stultifying role of good-frau-dom liberated her creativity. Or if she had the guts to live as a lesbian for decades because she was a free spirit anyway! Sibelius Park. A monument in his honour– 24 tons of steel tubes arranged like a large, silver Surrealist organ. Sibelius’s giant, dismembered head! Rock Church, literally hewn out of granite–Scandinavian assiduity and ingenuity Loved tiny, magical Philajasaari Island, full of rocks on which to sunbathe, tiny islands connected by bridges, covered with wildflowers, inviting beaches at every turn, views to feed the soul! I loved Helsinki Zoo, on a beautiful 22 acre island. I adore animals, and could watch them for hours. Time feels suspended as I watch them. We saw the otters at feeding time The snow leopards had cubs, as did the lions. There were large numbers of kangaroos. Kallio Kirke, an Art Nouveau Evangelical Lutheran Church Then to Jarvenpaa, the countryside outside Helsinki, a beautiful drive through fields full of wild flowers, to Ainola, the house of Sibelius (the most famous Finn, well, after the Moomins!) He bought Ainola when he was 38 and lived in for 53 years!! Life is long. Surrounded by rural peace and the lake, his creativity blossomed–well, until a long, paralysing two decades of perfectionism and composer’s block–when he composed symphonies, and then trashed them. The price, sometimes, of fame achieved too early. Finland was an eccentric choice, perhaps, but our family thrives when we alternate hard work with a complete change–and Scandinavia is so beautiful in the summer, and there is a thrill in exploring a new country and a new culture. I am so glad we went! Meeting Sambath. 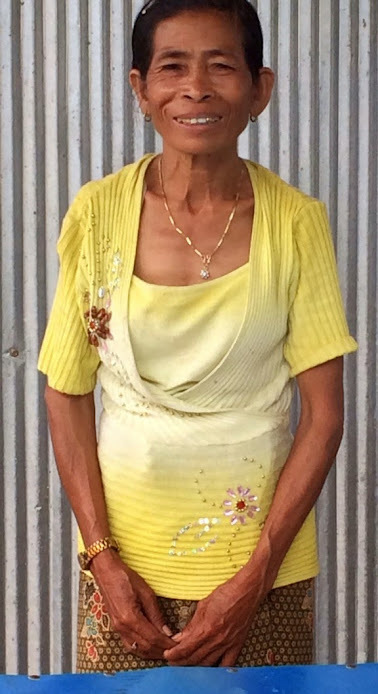 “She’s a woman, but works like a man,” the Tearfund worker said–keeping her family going, growing watermelons and rice on unused strips of land she rents from neighbours who work in Phomh-Penh’s garment factories. I watched her give a bag of fresh grown rice (which I had never seen before!) to the Tearfund worker, refuse payment, but say, “If you like it, in future, don’t buy from the market, buy from me,” and photographed the conversation, three Asian women all comfortably squatting on the ground, in a way I am now too stiff to contemplate, companionably talking, keeping their clothes clean. Sambath invited us to her house: a trek down narrow dirt paths to a house built on stilts (because waters rise in the rainy season and there are floods). I loved being there, following the flock of chicks around, looking at the eggs and the brooding hens. 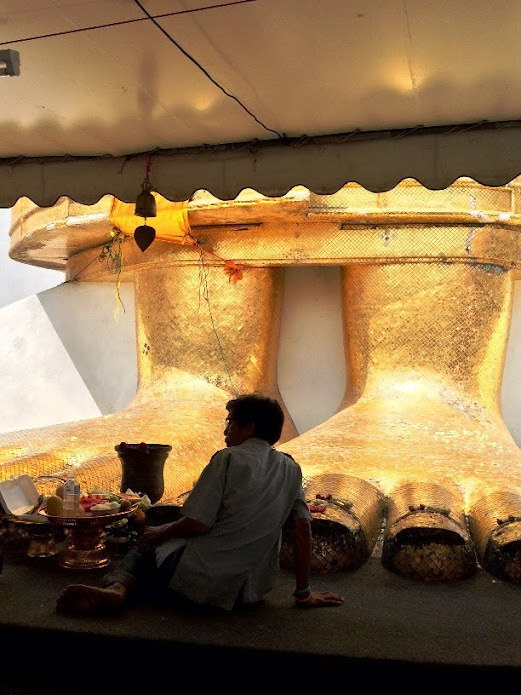 Cambodians are possibly the slimmest, lithest people in the world. Most women seemed to weigh less than 100 pounds, men too! We clambered onto a lengthy makeshift bridge made of palm trees cut in half to floating platforms: picnic spots. I tried, but felt anxious at the thought of falling in the dirty water of Tonle Batie Lake to the accompaniment of the laughter of the picnicking Cambodians (whose default reaction to anything out of the ordinary is to laugh). And so I sat on the steps facing the lake, with a 21 year old Cambodian Tearfund volunteer, and chatted in English. He told me about his dream of owning a rice factory and how he was saving for it. It cost USD $8000, he reckoned. He asked me several times to pray that he’d achieve his dream. I simply could not see how this sweet young man could compete in business in a corrupt country, in which rice, the staple food, is probably controlled by conglomerates; however, my husband and I are dreamy unworldly people and we have managed to run a successful small business. God gave and continues to give me the ideas I need, step by step, and there is no reason that he would not give them to M.
That was another magic moment for me, sitting there, facing Tonle Batie Lake, swapping life stories and sharing precious dreams across a divide of race, gender, decades, culture, and profession, human sympathy a bridge, like the bridges to the floating shelters. 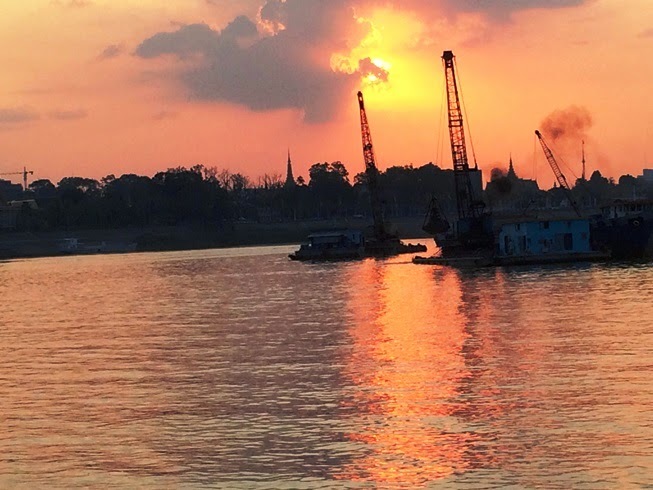 Cruising at sunset down the Mekong on fire, totally a magic moment. 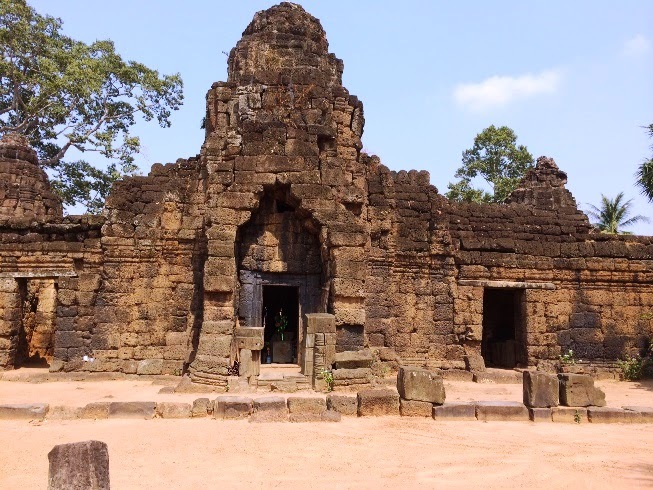 Ta Promh, an atmospheric ruined 12th century temple in Tonle Batie, fascinating, a bit like the spooky ruined Greek temples I saw in Greece—and, oddly, in Sicily too. 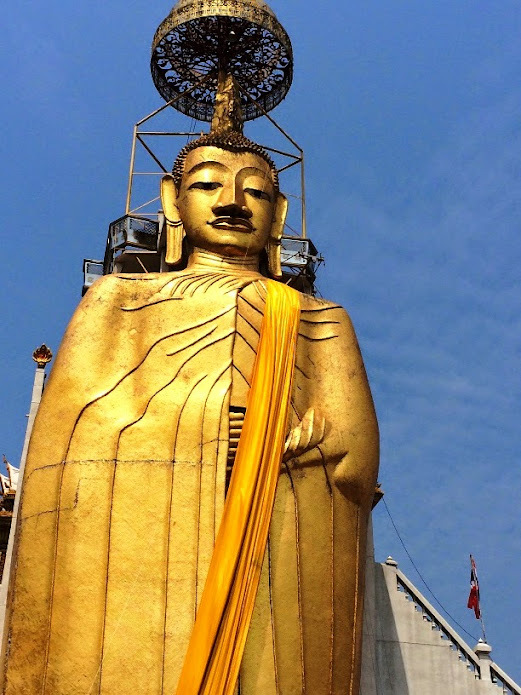 A day in Bangkok on the way, visiting an impossibly over-decorated Buddhist temple. 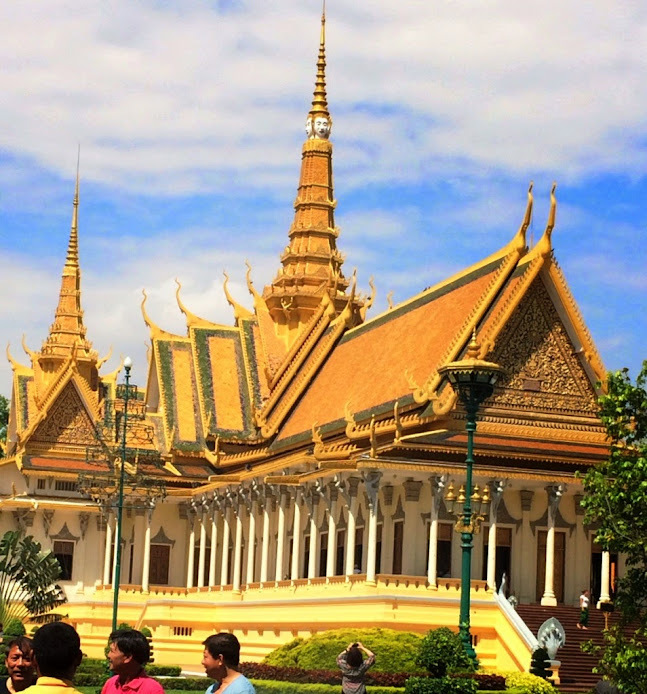 The Royal Palace in Phomh-Penh. Cambodian Flora. The Cambodians themselves, especially the smiley helpful Tearfund workers. I loved Kagne, the Tearfund worker who accompanied us. 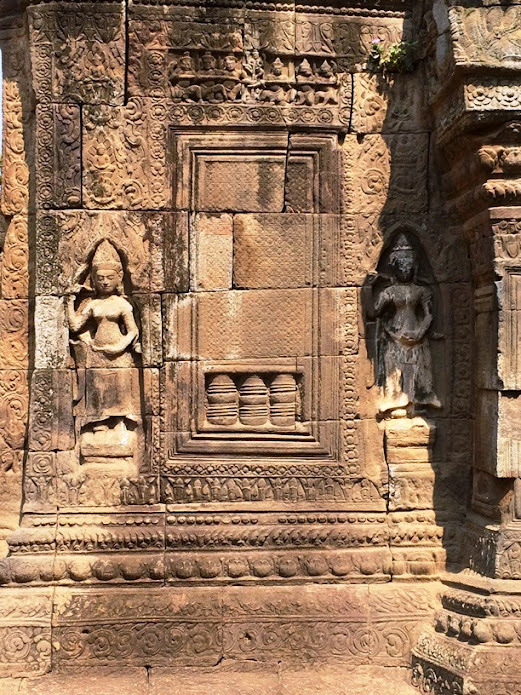 Cambodians have a natural restraint and dignity and effortless good manners and courtesy I found very attractive and winsome. Attempting to dig a field with a bunch of Christian Cambodians. Discovering that I lack all talent for digging. 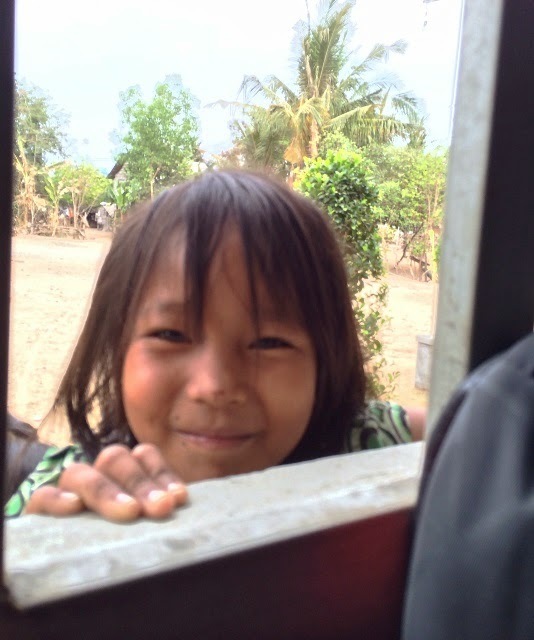 Cambodian children, naturally smiley—as children are everywhere once detached from electronics. I enjoyed (and was a bit amused by) the Tonle Batie Church, church in an agrarian economy, most unlike mine, St. Andrew’s, Oxford. There was a community pig. Flock of community chickens wandered around. Chillis , tomatoes and peppers were grown on spare bits of land. English lessons took place in the church hall, and the worship was rousing and charismatic! Here is a section of my piece for Christian Today. 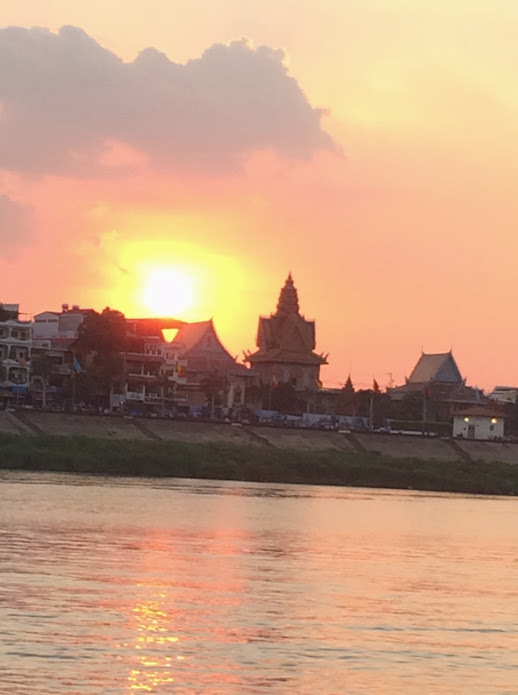 “Blogging for Tearfund in Cambodia was an honour – which I mean quite literally. 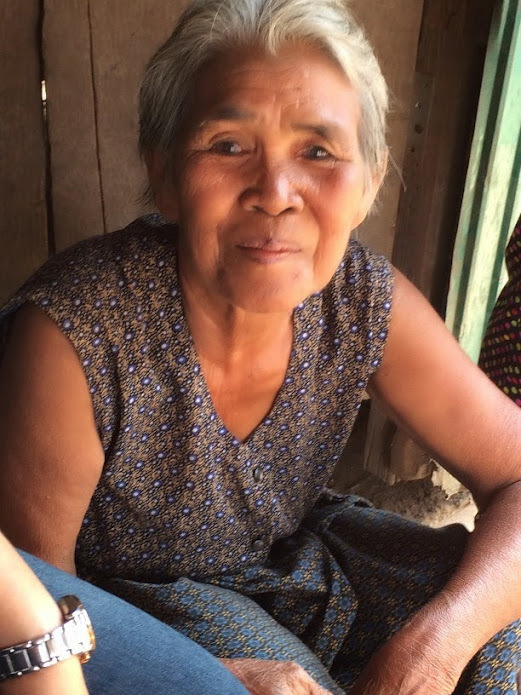 I felt honoured to enter Cambodian homes, and step over the threshold into their lives. I felt honoured to meet people who with great dignity, resilience and self-reliance earn their living by gathering wood from the forest, trapping fish in Tonle Batie Lake, raising pigs and growing their own rice. I like Tearfund’s Umoja model of development, particularly asking people their dreams. Being asked to dream introduces hope and possibility into a life. Umoja then encourages people to look at resources they do have; apparently most begin by saying they do not have any. Encouraged to think outside the box, Mechyan, an elderly HIV positive widow who lived on church land, grew chillies and basil in old mesh rice bags and made powder to sell from the nutritious moringa trees growing wild on the property. Vanny created a worm farm from cow dung to feed his chickens and aerate his vegetable garden and Yiv Toch taught others how to raise chickens. It’s the parable of the talents in action: use the little you have to gain more. As an Umoja facilitator told us, Jesus did feed 5,000, but he took people’s five loaves and two fish to do it with. Their very own Umoja project! I feel my heart, mind and imagination have been stretched by meeting people from a different culture, who make their living in difficult circumstances, in a country without welfare or a social safety net, but with great optimism, cheerfulness and diligence. When I hit roadblocks which frustrate me, I will remember the Cambodian Tearfund office workers who bought us dongles to help our laptops work anywhere in Cambodia. They worked on configuring the unfamiliar laptops for well over an hour till each of them worked with the dongles, (a task which frustrates us whenever we travel) and similarly worked with our latest model iPhones until they got Cambodian SIMs to work in them, cutting the SIMs down to size, doggedly persisting until they were successful. Okay, it was my first attempt at raising funds for a good cause—though it will not be my last. Sadly, we haven’t reached our fund-raising goal. Our target was to raise 60 new supporters for Tearfund who would commit to giving £3 a month. This money will go towards encouraging self-sufficiency in Cambodia through the Umoja project. We’ve reached 48. Will you be one of the those 12 people? If you would like to support Tearfund here, (sign up on the top left-hand corner), I would like to offer you a gift. Wandering Between Two Worlds: Essays in Faith and Art traces my life, my struggles, and the evolution of my faith in essays. It deals with dichotomies—East and West, Writing and Prayer, Domesticities and Art, Roots and Wings, along with my conversion narrative and an account of working with Mother Teresa. which has sold the best of all my books, is a children’s book, dealing with art, Florence, The Renaissance, beauty, good-heartedness, weakness, and the importance of forgiving oneself. The Meek Shall Inherit the Earth is a reflection on that Beatitude, theological writing for everywoman. The Church That Had Too Much is an odd book, the record of a dream; I found myself writing it in the shape and rhythms of poetry. AND a fifth one shall be sent to you when it is finished…a free e-book of my newest book, still in process “A Handbook of Christian Writing.” It is both practical and spiritual!